Those involved with recruitment firm must understand the need of an attractive and convenient job portal to magnetize as many applicants as possible. However, the good job portal has an effect on the employer as well. If employers or the applicants figure out any kind of website issues or else any poor feature implementation, they will quickly suspend the site without thinking twice. So, it is much important to select useful job board WordPress themes for your business that will provide enough room to grow it. There is a need to regularly update the website while ensuring to make it error free and adding new functionality very often to hold the customer base. But in case you are using a custom built site, these all things are really hard to implement and this is where the WordPress themes comes to work. Thousands of job board WordPress themes are available that allow the users to set up a job listing with ease. Also updating the website very often is not a big deal as the theme developers keep on releasing updates. This is something which is not possible in custom built system or else will cost you enough. 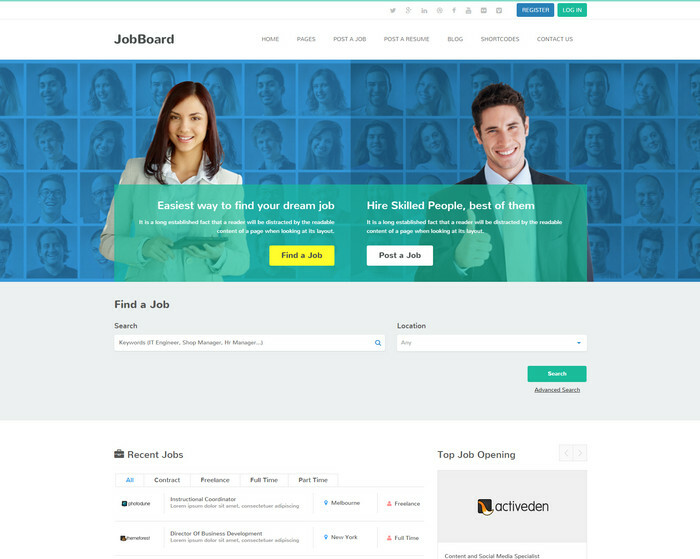 These job board WordPress themes are available in diverse size and shapes. So, whatever is the requirement either it is to create a simple list of current employment opportunities or there is to be created a resource so as to put the freelancers and employers in good touch, ample suitable themes are there to choose for the specific purpose. Here is a list of some useful job board WordPress themes for job listing websites and job portal. All these below mentioned themes are responsive and features front end submissions, payment gateway, resume creators, visual builders and more. After choosing the best suited theme for your site, install it and you will be good to go. With a clean design and minimal layout offered this theme provides great user experience while it is highly configurable at the same time to make the website according to your need. Also you do not need to spend any extra money to have any third party plugins as all the functionalities are bundled in this theme. The functionality is again extended using tons of template engine and WordPress actions. Packed with high quality codebase, this WordPress theme is very stable and let you enjoy a good value for small price. Featured with front end submission, responsive layout, retina ready and other useful functionalities this is a great Job board WordPress theme to go for. 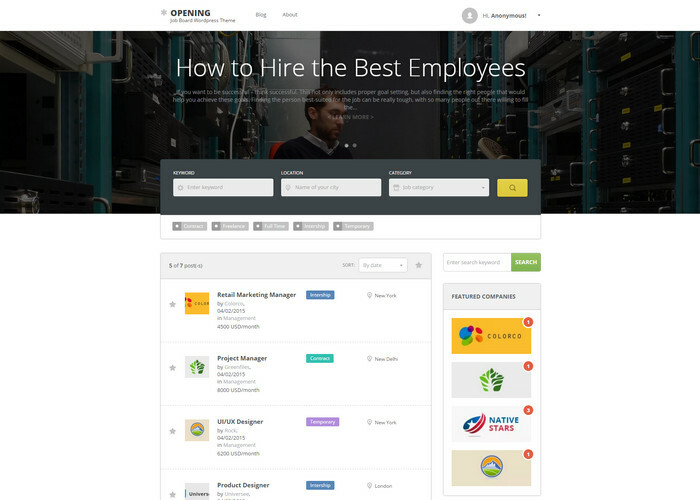 Opening is one of the best job board WordPress themes that aim to connect the job seekers with the employers. So, if you are an employer can advertise the vacancies here while the registered job seekers in this website will send you resumes for the suitable position. The interface is no doubt clean and neat but still there is option to create your own unique interface by customizing the existing graphics. The editing process is quite simple for the end users while this theme has a fixed layout. Overall, well structured code, cross browser compatibility with the modern interface made it an ideal choice for job portal website. 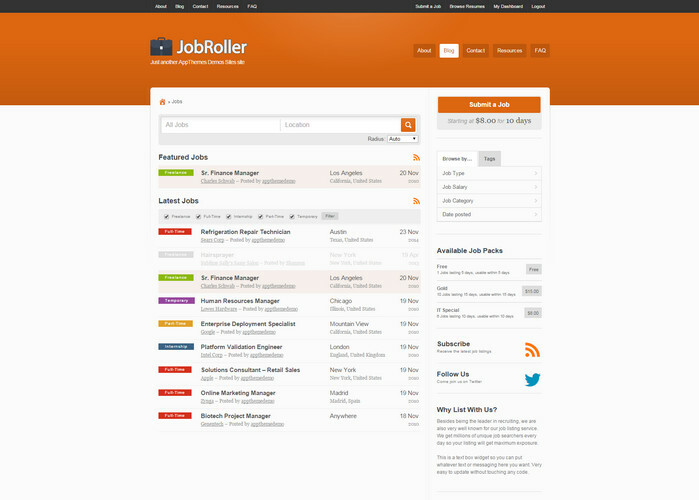 With a clean, modern and fully responsive design, JobsFinder is an ideal theme for job listing and job portal website. The focus is fully on the user experience so you can be assured that your user will not find it difficult to navigate through the website. Features like Page Layout Builder, sidebar manager, retina ready, WooCommerce ready, Parallax slideshow, WP Job manager, resume manager etc. made this theme must have for the recruitment firm. The fully responsive design makes sure that this theme can run on most of the screen size and the slideshow of the theme is hardware accelerated and touch enabled which indicates it can work perfectly on iPad and iPhone. WorkScout help you construct a fully functional website in just a matter of moment. This is very user friendly which can be used by any recruitment agency. The theme is included with visual composer login that makes the page construction very instinctive. WorkScout works on every screen size so the job post will be showcased in Smartphone, tablet, desktop computer and laptop. You can expand the theme further using add on features such as Resume Manager tool that makes it easy to upload resume. In case anyone do not have professional resume, pre-designed forms are available for them. So, get this theme and make the website appealing and professional. Packed with an insightful interface and charming design, this theme is the perfect choice for those interested to create a professional job portal website. You can very easily set up the website using this theme that does not require tampering with code. The job posted by employers will be sighted in a very organized way while users can perform action like edit, delete and mark filled in need. 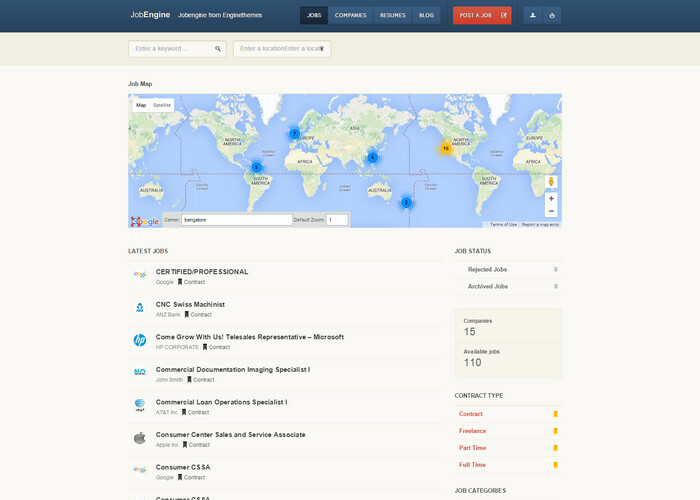 The employer can post job on the front end with providing job description and location. The job seekers can apply to the jobs by writing a mail to the employer. The interface is too simple so, you will definitely find it easy to work with this theme. This is another powerful WordPress theme for job portal that is fully responsive. So, the website designed with this theme will be opened on all kind of devices such as laptop, desktop computer, mobile and tablet. Other third party plugins can be used for expanding the features of the job portal website. Candidates and recruiter/agency both will find out the theme much easier to handle and navigate through that makes it very user friendly. The interface is clean and bright but has a very modern look to attract numerous visitors. Powered by the Framework Cherry, this theme is just appropriate to succeed soon. 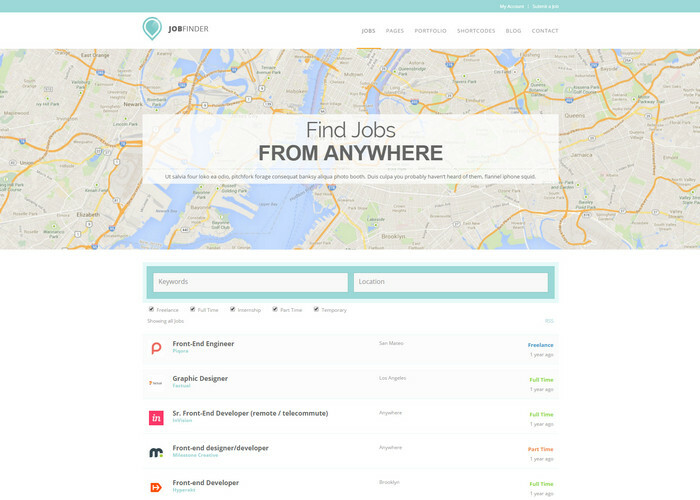 A beautiful WordPress theme for job portal that provides several options for monetization where you can receive money for job posting and submission. The home page is featured with fully functioning map, a slider and a cityWise Banner. The newly implementation of color customizer makes it easy for users to create a page matching their vision. This is a fully responsive theme where every page and section can be viewed on desktop computer, Smartphone, tablet and laptop. The users can be assured that the job and post won’t be overlooked by Google as the theme is made optimized for Google search engine. The inclusion of job submission form ensures that the employer can include their own criteria. This is one of the best WordPress themes for job portal and listing which includes all the required functionality to generate and run a fully fledged website for job board. This theme from the Engine Theme team is very clean with having a very modern look. Some of its useful features are: Display of job listing, accepting online application, Website monetizing with several payment option, Ajax filtering, navigation for minimizing the page loads, notifying users on special event using email templates etc. Overall this responsive package has all that is needed to build a good website along with making it visually appealing. This fully responsive WordPress theme is able to help you build an exact job portal website to attract as many users as possible. It has a clean and modern looking interface that is user friendly as well to help users in easy handling of the website. JobFinder is SEO optimized so, you are definitely able to attract high traffic with a high Google ranking. 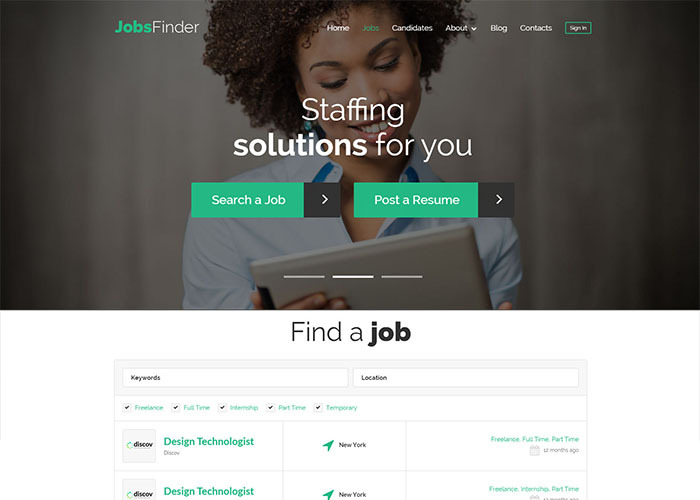 The theme runs on all screen size, so mobile, laptop, desktop or tablet anything you have, JobFinder will be loaded everywhere. Its other key features include WP job manager, WP resume manager, WooCommerce ready, retina ready and more. 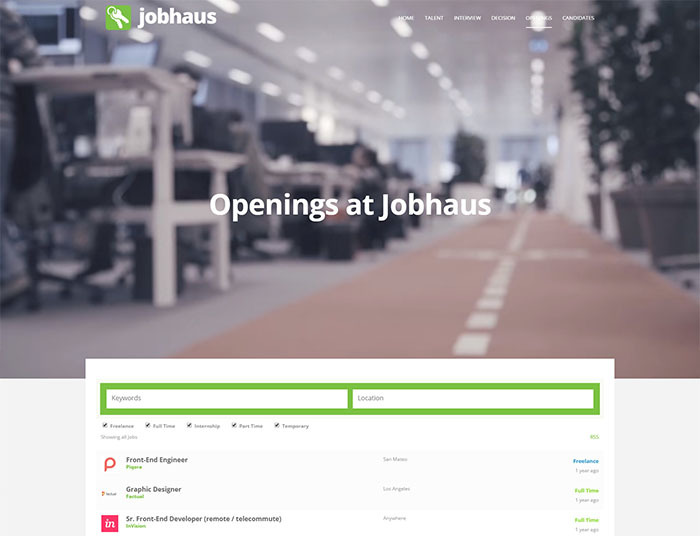 If there is a need to start a recruiting website that works the way you want, JobHaus might be one of the best choice for that. 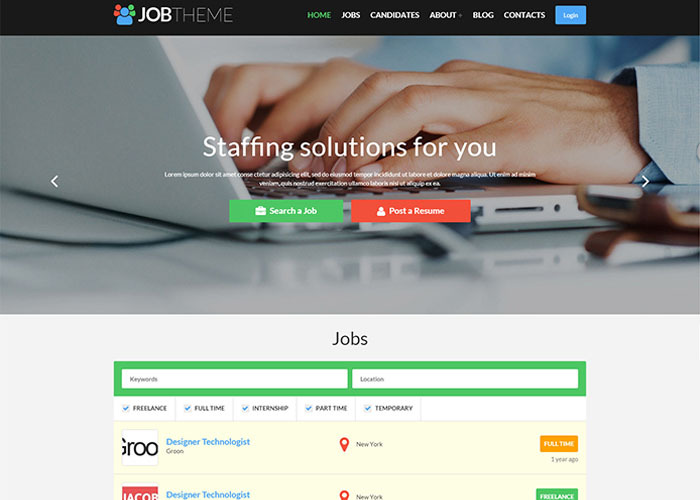 Equipped with all the needed features and functionality, this theme is perfect from everyone’s such as recruiters and job seekers point of view. The responsive layout makes sure that the visitors can access the site from all kind of devices. While it includes most of the required features, addition of other plugins enhances the usefulness of the site. Also there is option to make modification in the color, layout and fonts through admin panel that does not require any coding knowledge. 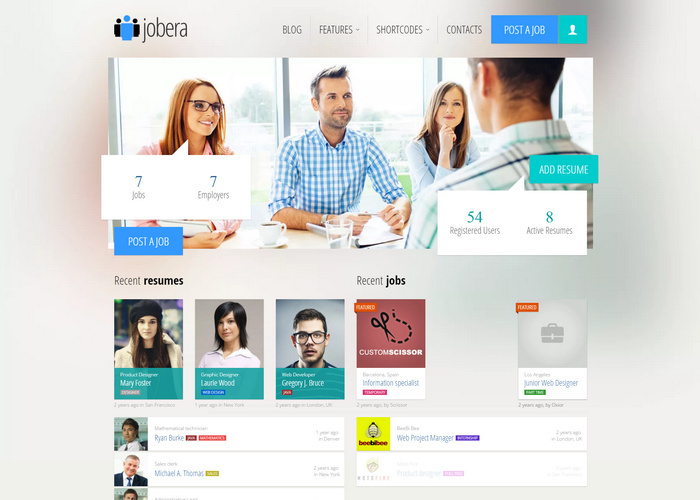 If you are in the search of an all in one job board WordPress theme, JobRoller , the responsive WordPress theme can be considered checking out that is designed keeping in mind both the job seekers and employers. The theme is very user friendly where the job seekers can create their profile, upload CVs and apply online to the listings job with ease. Even though it mainly contains five job types to organize the advertised vacancies but there is always an opportunity to create custom job types if required. This JobRoller can be expanded again using the plugins available in AppThemes Marketplace. 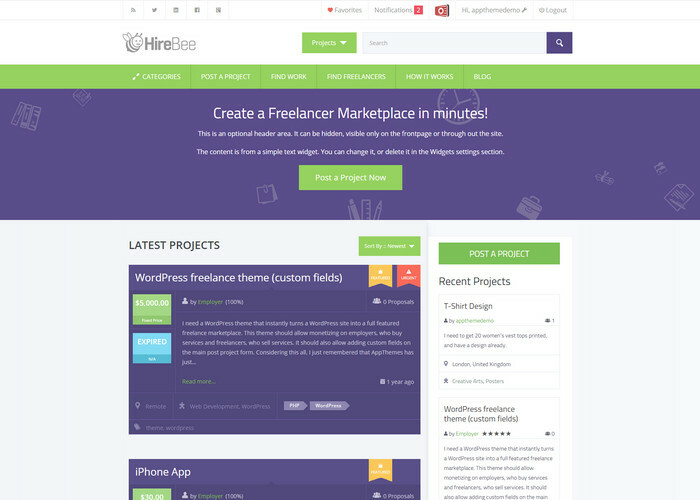 HireBee is perfect to create an online freelance marketplace ensuring it will look professional and trustworthy. Just install HireBee and let the freelancers and employers register in your website. Here the users first create their profile and then apply to the listing job or else post jobs. It includes a project bidding feature that ensure the employers will get the best value for their project while the freelancer can stay competitive at the same time. Now, when it comes to monetization, there are several options to generate money from it such as charging money to the freelancers for posting proposal to a listing while the employers can be charged to post job listing. 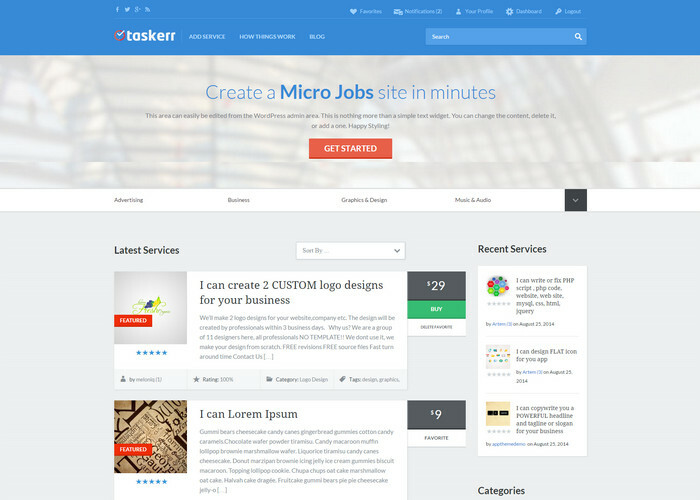 Taskerr is there to help out all those looking to create a micro job portal in just couple of minutes. This is a very useful theme from Appthemes loaded with entire small and unique features that are mainly required to build a micro job portal. This feature rich theme generates a great looking and premium quality job portal with ease. With a great layout and modern looking design Taskerr theme also provides an option to choose from the five built in color or design to make the Website look as you want. The homepage looks excellent with an amazing introductory banner and here most of the focus is maintained on content only. 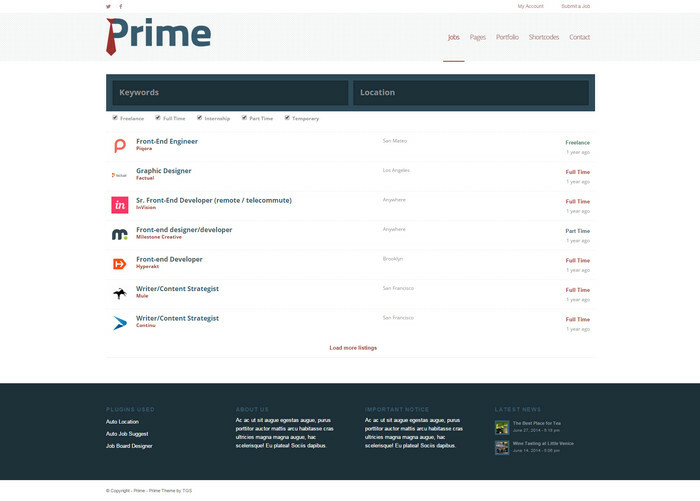 Another great job portal and listing WordPress theme is Prime packed with a clean and modern interface. The layout is fully responsive to run the site in every screen size. There is no need of having any knowledge in code but still users can built a unique and beautiful job marketplace through this theme. This retina ready WordPress theme appropriate for job listing website is featured with parallax slideshow, WP Job manager, WP Resume manager and much more. Here the emphasis is put on user experience so, all the recruiter and job applicants will find it easy to use and navigate through thus you are obviously to see a great result in less time. Featuring a fully responsive design, WooCommerce integration and front end submission this is one of the all time favorite WordPress theme for job listing. It also includes a range of monetization option that is used for selling job packages or subscription. Jobify boasts a quick installation and set up through which users can enjoy a fully operational website in just minutes. In case you are facing any issues during installation, take help of the video tutorial that comes with the theme. The design is neat, clean but has a modern look with aesthetics like background image, rows, flat color schemes and ghost buttons. 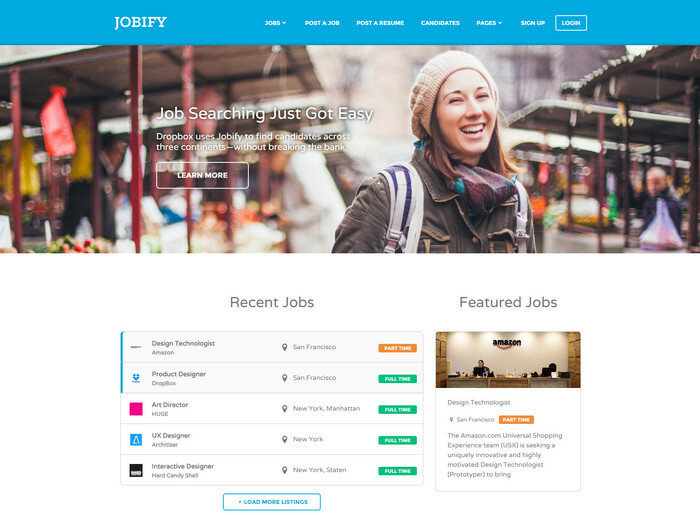 Jobify is an excellent premium theme for creating fully functional job board websites in a quick and easy manner. The fully customizable home page lets you design the page as you want. You can also put a charge for the job listings. 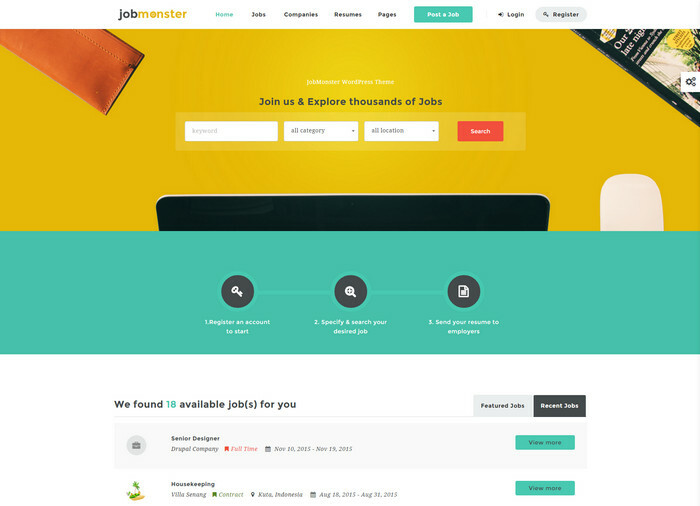 Realizing the fact that job board website require various types of features, the developers have provided extra care in developing the Jobmaster theme. As a result, the theme offers a complete solution for creating modern job board sites. The developers of this theme have made it straightforward and convenient to both the job seekers and employers using front end form submission all through the theme. This makes it easy for the job seekers to submit resume while employers can submit job listing with ease. This theme makes the website mobile friendly and Google map is also integrated with each job listing. Loaded with lots of employment related features and other useful tools such as premium Visual Composer plugin, JobMonster makes the website visually appealing and convenient. Also it does not require any third party plugins or themes as all the needed features are included in that. 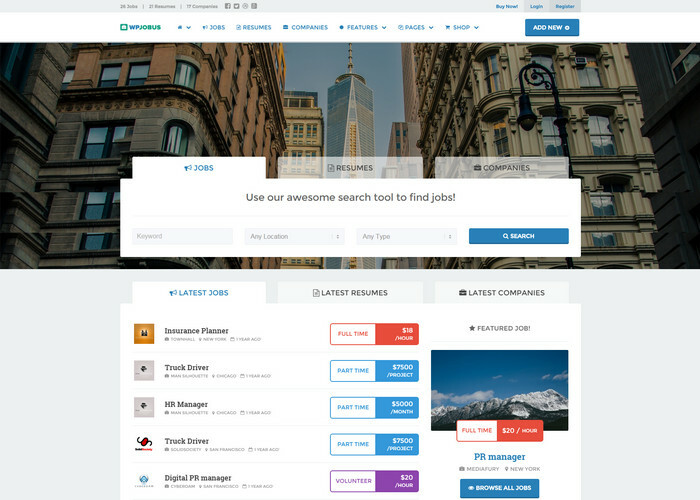 Featuring a modern, elegant design, JobBoard is an excellent job directory theme for WordPress. Features like job search, apply to job button, resume manager, resume bookmarking and front-end resume submission have made the theme very popular. Offering a positive experience to the users is the main aim of this theme. 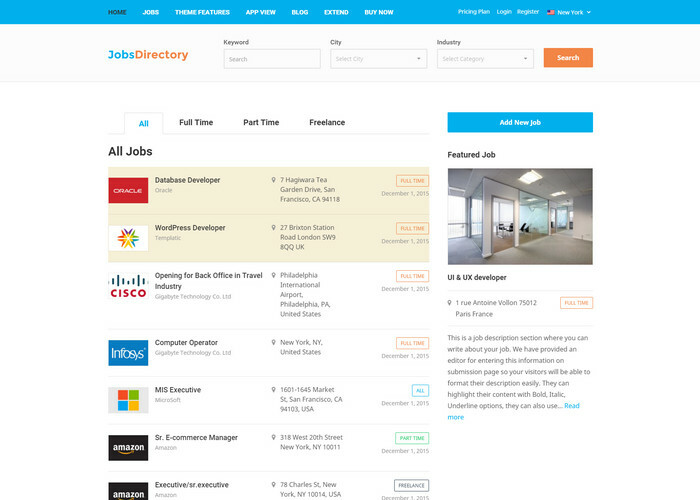 You can create an excellent employment marketplace using JobBoard that is very similar to that of the Freelancer.com or Odesk. While JobBoard is the theme you are using in your WordPress website, be sure that the users will get the types of job they are looking for while the employer can easily find out the appropriate contractor to get their job done. Here everything such as front end submission forms, job posting, the registration happen using custom form, so the process is quite simple and easy. It integrates with Paypal where collecting payment is done with ease. Besides creating regular job board websites, this truly multi-purpose themes could also be used to create company profile and/or personal resume sites. The AJAX powered theme is fully integrated with Google Maps too. The best part about this theme is it does not depend on any third party plugins and includes all the needed functionality to run a job portal website. Front end submission is a great feature that let the users register, login and creates a profile with ease. Also contact us, about and pricing pages are some of the useful templates comes with it that does not require you to design the page from scratch. When it comes to monetization option, WPJobus is again useful that includes accepting payments option via Stripe for actions like publishing a featured resume, company profile or job listing. The design is bright and modern. This very powerful job board theme helps you create job sites that will be helpful for both the employer and the employees. Along with the built-in CV manager, the theme is also compatible with most of the popular WordPress plugins. This responsive and retina ready Job portal WordPress theme let the users customize the appearance and other job board features to make the site attractive and best looking. Integration with Google fonts allow the users to choose from 100 of fonts available while the PSD files let you edit the images in the theme with Photoshop. 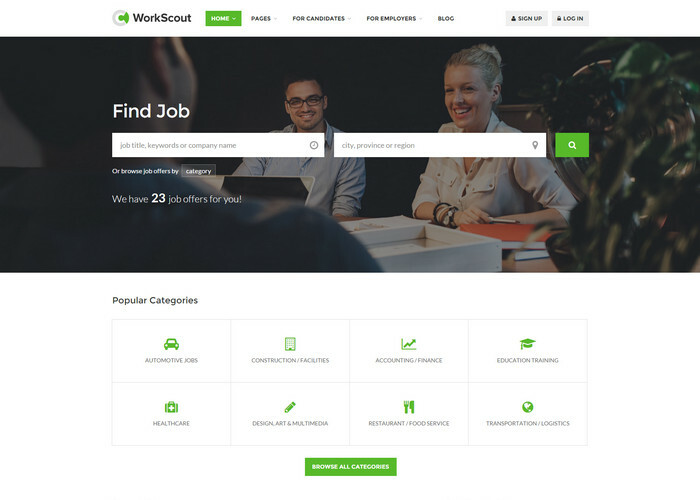 This theme is perfect for both the job seekers and employers. The job seekers can apply to the job listing using front end submission form which then reaches directly to the inbox of the employers. Uses of plugins can make the site even more beautiful and useful. Extremely enlightening fact you pointed out. Although I’m not using such themes but how you describe it’s importance.So that I can acknowledge its necessity.Thanks a lot dear.